What better way to welcome this New Year than with beautiful calendars. The yearly calendars make for a great use, serving the purpose and adding colour to the desk. 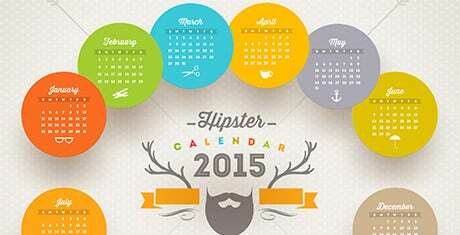 You can choose calendars with hundreds of themes, concepts and pictures. There is no limiting to the creative aspects here. Choosing a great calendar to gift yourself or the loved ones calls for careful selection. The same applies to professional purposes, when you have to gift thousands of employees with one striking date marker. This is where templates come into the picture. Calendar templates are important to shortlist and zero on that final choice before the print. We offer you a foray of designs in the form of templates that match and fulfil every scenario that you can possibly think of. Check out the various designs we have to offer in different categories. You will be amazed how far this could go to make that perfect yearly calendar for the entire year. What more, you can pick more than one template and make different kinds of calendars at one go, without expending too much time. Select from our range of calendar templates and get to work right away. Seriously, you will not be disappointed! Having a busy schedule to surf through all of them? Check out our section of perpetual calendar templates. The choices are clear and easy. You can pick them going by your thoughts and finalise on the design. No more sweating over what fits perfectly. We have it all ready! Specific about holidays? Check out the select list of holiday calendar templates from our lot. These templates are easily to pick, especially when you are clear about what you want. Great designs and streamlined formatting will make you come back for more. Select, click and get started with customizing the way you want. There is no easier way to customise than get going with a blank template. Our wide list of blank calendar templates should be enough to get you started without much fuss. Many designs, easy to use formats and effortless execution is what you experience with these. Give them a try. Looking for those special designs and layouts for a calendar? You may look no further. Our premium section of calendar designs should do the trick. Click, select, go – make up for one special calendar that you can use or gift to others. Surprisingly easy to convert, you will love these. Check out the wide selection of our designs practically laid out for easy customization and printing. You can say goodbye to all the hefty planning that requires a lot of time. These templates are quick to access, easy to choose and fast for printing. Save your time for better things. Our excel calendar schedule templates are excellent choices, if you run your entire year’s proceedings inside your inbox. These templates are easy to format and customise as per your own needs. Check out some great layouts and fonts that you will be super impressed with. Bid goodbye to those monotonous old dull and boring schedulers. You don’t have to look beyond to get to the ideal templates for monthly calendars. Simply choose from our many deigns and begin personalization. These designs are great for monthly use, presenting different options as per individual needs. You can also add your own dash of personality to them. A must try and use for all training purposes, these calendars come in great handy everytime you need to revisit your progress with that most important training of your life. Do check out the designs and you are deemed to be left impressed. Check out the wide range of birthday templates for using on the special occasion. Be it for surprising someone you love or throwing a big birthday party, these calendars come in handy. Easy to use and format, you will save time trying to figure things out on the big day! Perfect for daily use, these templates are set to astound. Do away with the boring and bring in some style to your everyday planner with our daily calendar templates. You are bound to bring in some in some colour to your daily routine. Have a crucial business to run and take care every single day. You will need a calendar that serves the purpose of listing your planner perfectly. Check out our wide range of business calendar templates. You can now easily put together all your plans at one place with ease.